2003 UT55 was discovered by Jana Ticha, Milos Tichy and Michal Kocer at the Klet Observatory with the 1.06-m telescope as part of their ongoing KLENOT project. It was discovered on images taken at 22:42 UT on 26 Oct 2003 but trailed images were also found on frames taken up to 10 minutes beforehand. An animation from the KLET observatory shows the rapid movement at discovery. The object was posted on the NEO Confirmation Page at about 1am on 27 Oct 2003 with temporary designation NK0415 and was first noticed on the NEOCP at Great Shefford at about 01:20 UT. The original ephemeris indicated it was mag +17.1 and moving at 106"/minute (though this was subsequently updated to +17.0 and 103"/minute) but without any indication of the uncertainty area that the object was likely to be found in. The first search images from Great Shefford were taken at 01:24:40 UT, but by then the altitude of the object was already just 32° and just above the tree line to the southwest of the observatory. Within 15 minutes the field was partially obscured by the trees and by 01:50 UT was out of sight. Sets of images were taken with exposures of 20 secs, 10 secs and 4 secs to try and locate the object but it was not located on the images before the field had disappeared behind the trees. 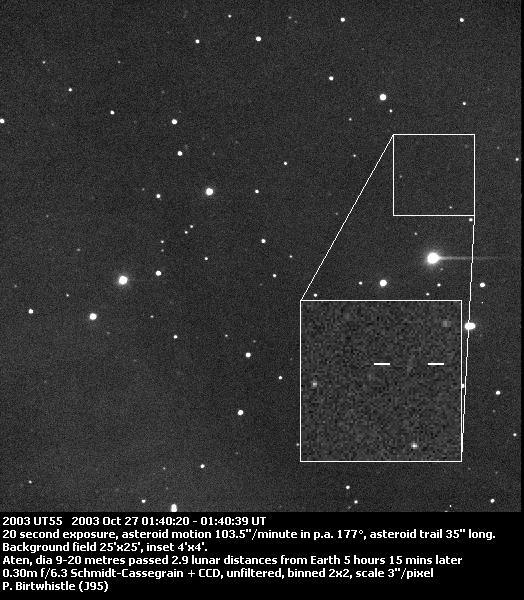 The field of the first set of images taken to search for NK0415 happened to catch the object very close to the right hand edge of the frame. An enlarged area is shown to the right, with an animation of the first three frames taken, showing the rapid movement of the object and the change in brightness between frames. Each frame was a 10 second exposure and the asteroid trailed by 17", or 5-6 pixels. Subsequently a number of the frames were found to have faint images of this fast moving asteroid and were measured and reported to the MPC. The object was left on the NEOCP for a further three days as it raced deep into the southern sky but no further positions were reported from any other observatories. MPEC 2003-U96 was issued by the MPC at 02:30 UT on 30 Oct 2003 and assigned NK0415 the provisional designation 2003 UT55.